Today is the 58th birthday of Alex Puchner, who’s the Senior Vice President of Brewing Operations, and its first brewmaster, for the BJ’s Restaurant Brewhouse chain. He started with the chain in 1996, a co-founder, when they built their first brewpub. Alex had been homebrewing for a decade before that first brewery. 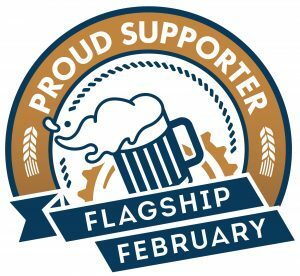 There now have 174 locations in 23 states, although they backed away from their brewpub model and contract most of their beer, but have added lost of guest taps and good bottled imports, including a great selection from Belgium. 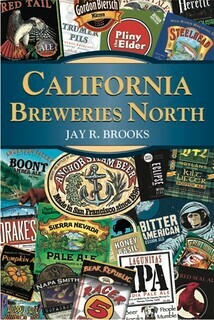 Alex has been very active over the years in the beer community and the CCBA, and has been great for beer in California, providing many people’s first introduction to craft beer with BJ’s. Join me in wishing Alex a very happy birthday. 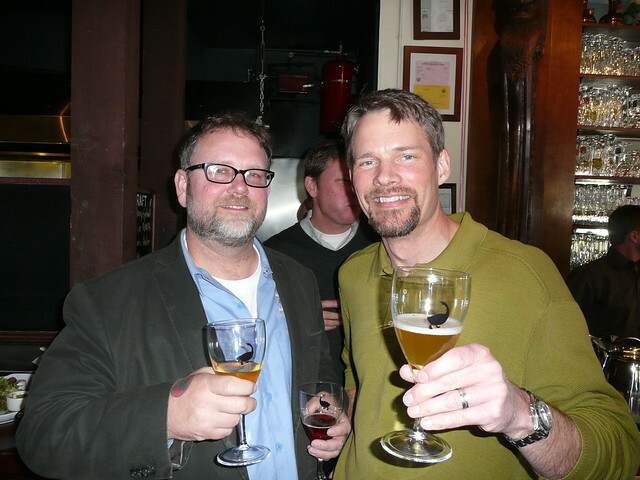 Alex with Greg Hall, formerly with Goose Island, during a visit to San Francisco a few years ago. Alex in the brewhouse (Note: purloined from Facebook). 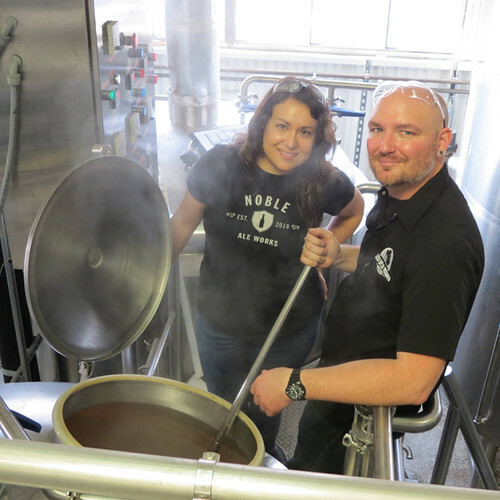 Today is the birthday of Alexandra Nowell, brewmaster of Three Weavers Brewing in Inglewood, southwest of L.A. She’s brewed previously at a variety of Bay Area breweries, including Moylan’s and Drakes, before moving south to Kinetic Brewing a few years ago. More recently, she joined Three Weavers, located in Inglewood. Join me in wishing Alexandra a very happy birthday. The Drake’s/Stone Quarter Century of Issues Celebrator 25th Anniversary Pale Ale brew crew (from left to right): Drake’s owner John Martin, Stone Northern California regional brewery rep. Dave Hopwood, Stone brewmaster Mitch Steele, Stone San Francisco regional brewery rep Michael “Zippo” Parzick and, obviously the only one doing any real work, then-Drake’s brewmaster Alexandra (on the brew deck). 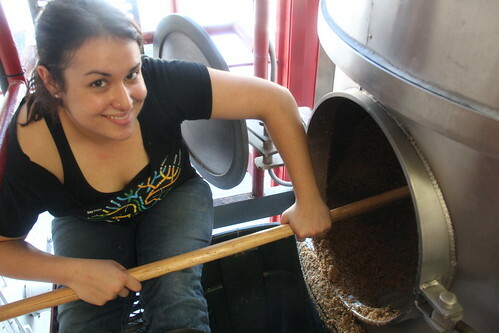 Alexandra scooping out spent grain at Drake’s. 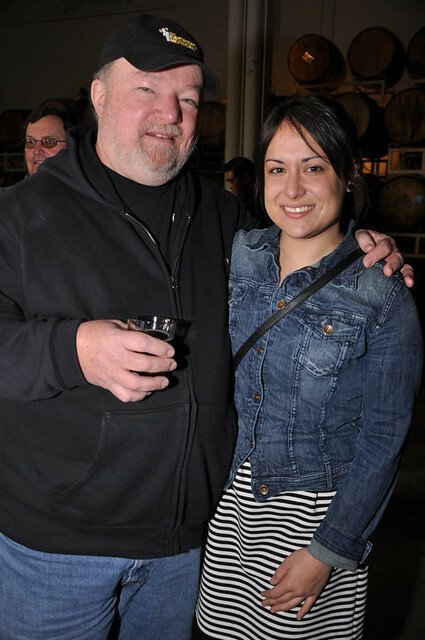 With Jesse Houck, who also worked at Drake’s, and for a time brewed at Golden Road. 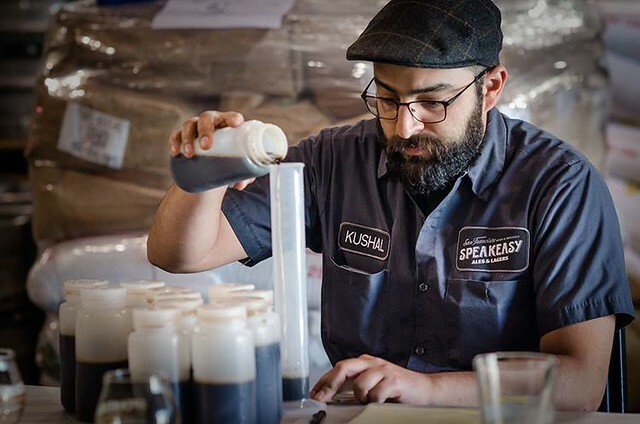 in L.A., but more recently moved to Hawaii to brew on Maui with Maui Brewing. 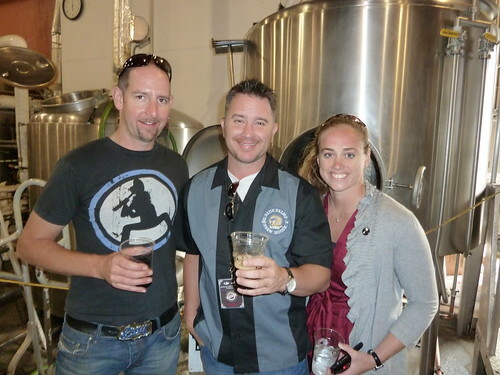 Today is the birthday of Meg Gill, founder and owner, along with Tony Yanow, of Golden Road Brewing in Los Angeles. 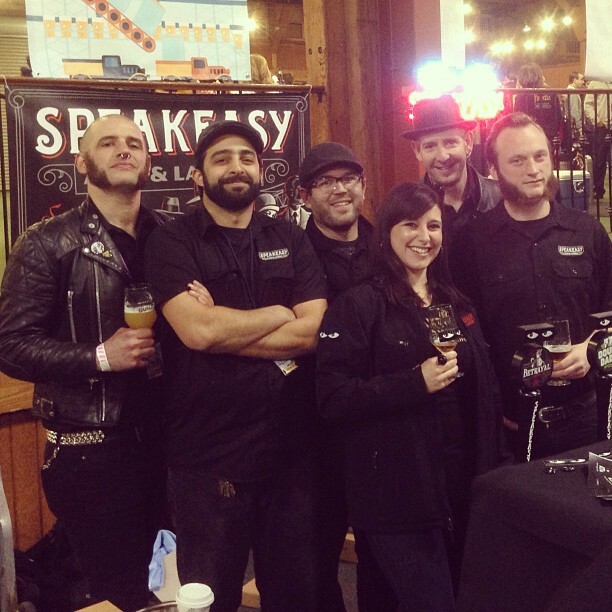 Meg is also the former national sales manager for Speakeasy Ales & Lagers in San Francisco. 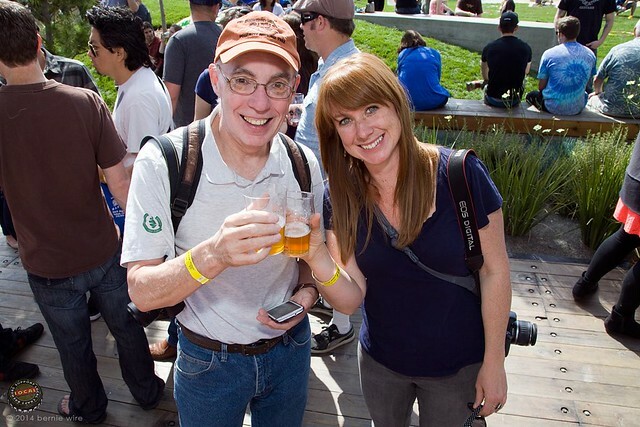 When I first met Meg she was working for Oskar Blues, and later she organized the Opening Gala for SF Beer Week in years two and three, a Herculean undertaking. Golden Road made some waves a few years ago when they were acquired by Anheuser-Busch InBev, and I haven’t seen her since she went over to the “winning team,” and alienated us losers. Although she did try to pretend it didn’t happen when Golden Road announced they were building a taproom in the Temescal area of Oakland and were met with some opposition. Ultimately, it was approved and they should be building a brewpub in the near future. Still, join me in wishing Meg a very happy birthday. 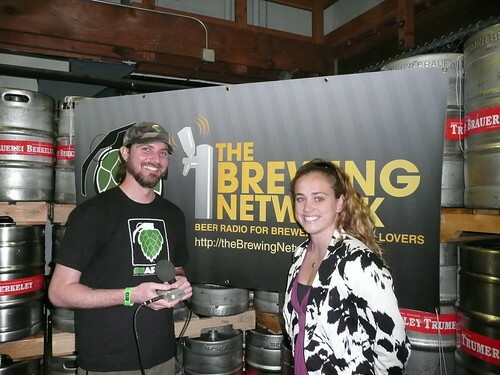 Justin Crossley, from the Brewing Network, with Meg at the 22nd Celebrator Anniversary Party in 2010. 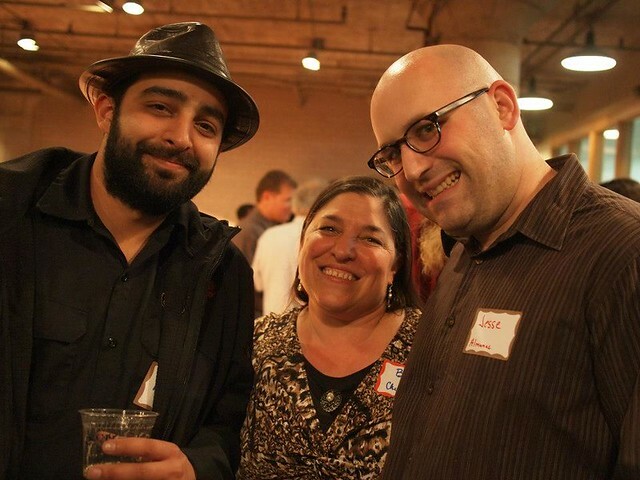 Speakeasy owner Forest Gray, Brian Lenzo, from Blue Palms in L.A., and Meg at a Speakeasy Anniversary event several years ago. 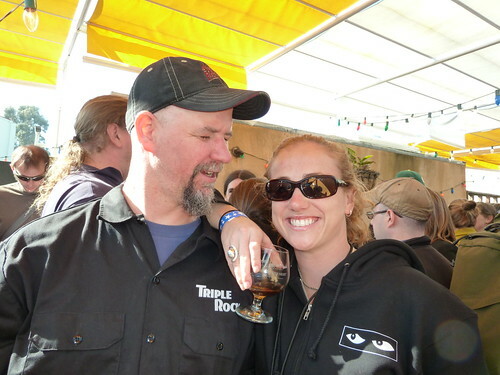 Faction’s (then Triple Rock’s) Rodger Davis, struggling to keep the sun out of his eyes, with Meg at the Sour Fest. 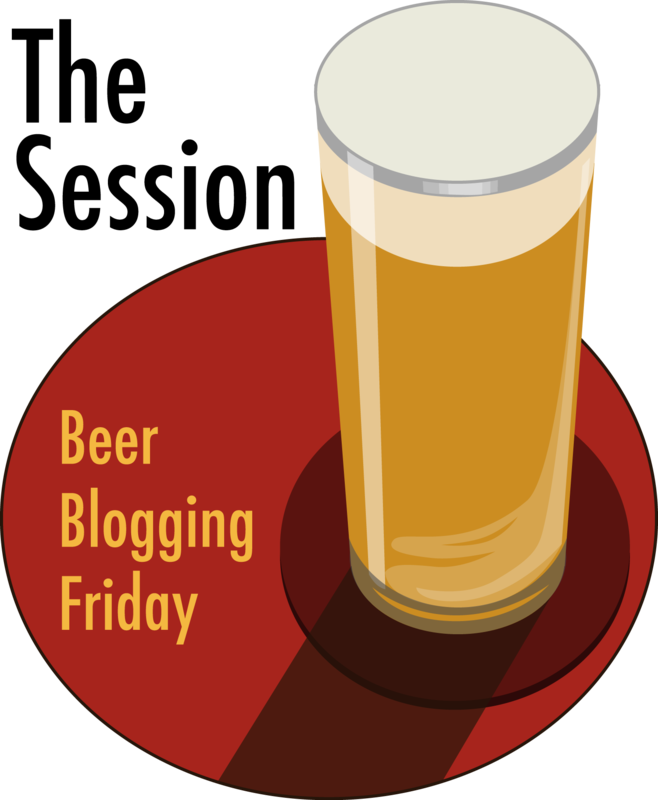 Today is the 31st birthday of Erika Bolden, who among much other beer writing in the Los Angeles area, is the Executive Director of the North American Guild of Beer Writers. She has the Herculean task of keeping the rest of us miscreants in line and on task, and she does it with such grace and style that we hardly notice. She’s also run the awards for the last few years, and has grown the event severalfold. Plus she’s an awesome tent neighbor, as we camped next to Sarah and me at last year’s Firestone Walker Invitational Beer Festival. Join me in wishing Erika a very happy birthday. Erika on the streets of London. 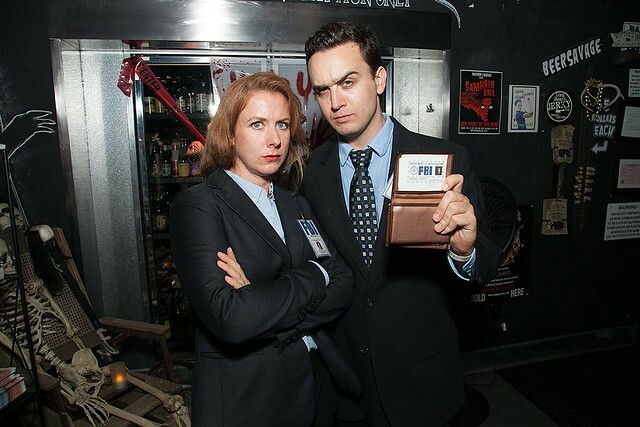 Channeling Dana Scully with fiancé Brandon Buck as Fox Mulder. 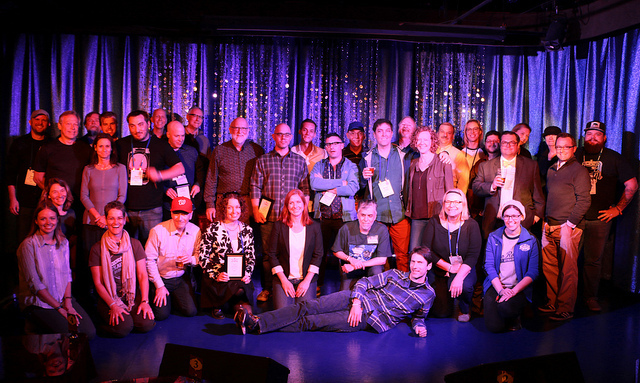 Erika, front and center (in the white blouse and black jacket) at our NAGBW awards ceremony in Denver last year. 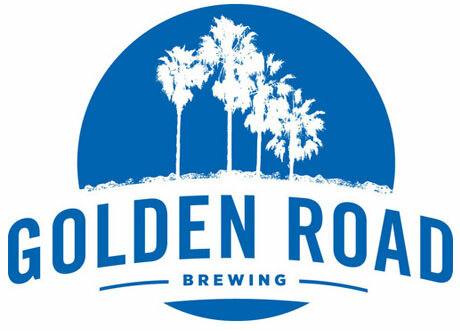 As the largest craft brewery in Los Angeles County, Golden Road expects to sell approximately 45,000 barrels of beer in 2015 and can be found in more than 4,000 retail locations. 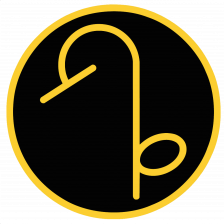 With a brewery focused on draft and can production, a pub in Los Angeles and a new tasting room downtown. 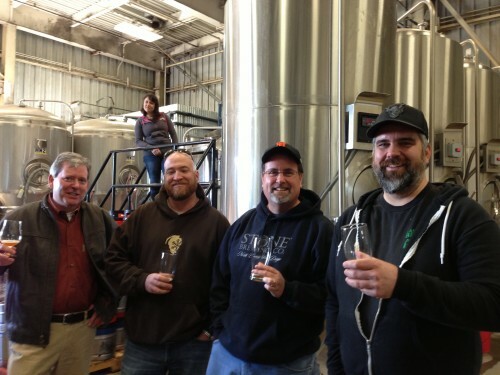 Additionally a new tasting room, opening in 2015, second production brewery and pub in Anaheim will be operational by the fourth quarter of 2016. Its core brands – Point the Way IPA, Wolf Among Weeds IPA, Golden Road Hefeweizen and 329 Days of Sun Lager – represent 95 percent of volume. 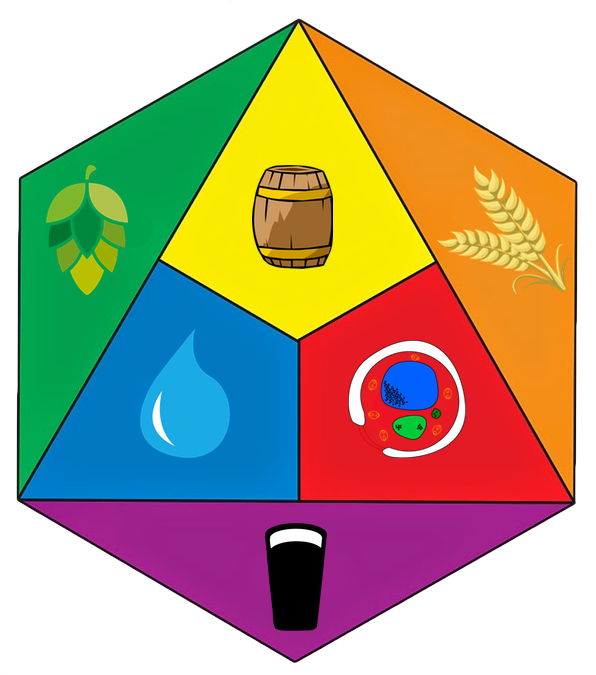 Along with the core beers, Golden Road brewers are constantly experimenting with the freshest ingredients through a collection of rotating, seasonal and limited-edition brews, most notably the Custom IPA Series, a line-up of diverse, hop-forward IPAs. 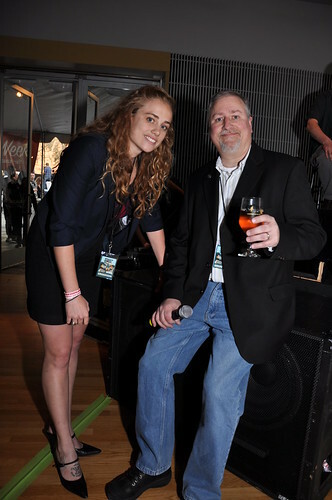 Meg and me at the opening Gala for SF Beer Week in 2011. Several major news outlets have picked up the story, including the L.A. Times, The Wall Street Journal, Fortune and the St. Louis Post-Dispatch. 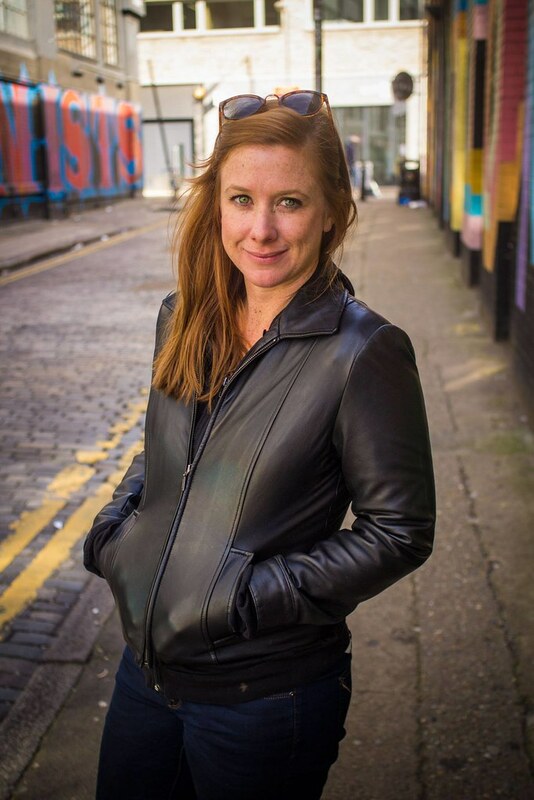 And here, co-founder Meg Gill talks about the deal in a video. Ah, the numerical beers. First there was Goose Island’s 312. After being acquired by ABI, they proceeded to file trademark applications for many other metropolitan area codes, leaving many to speculate that they’d start doing locally themed area code beers. When the overlooked the San Luis Obispo / Paso Robles area code, Firestone Walker snapped up, almost as a joke, and started producing 805. It may have started out as a humorous idea, but it’s become one of their best-selling beers in their home market. Golden Road, who’s down the road in Los Angeles, named one of their beers 329, not for an area code, but for the average number of days that L.A. gets sunshine each year. So they threw down about the area code beers in a musical parody entitled (Beers with) Area Codes, a spoof of Ludacris’ Area Codes (feat. Nate Dogg). The video features co-founder Meg Gill, and some of her brewery team, as they call out Matt Brynildson by name, and humorously dis his 805. 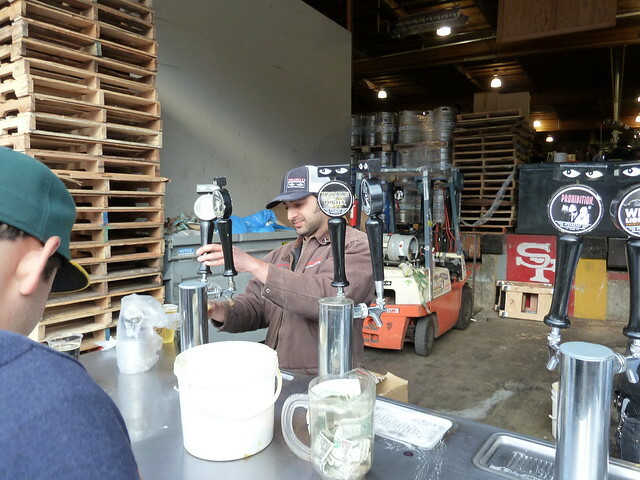 Golden Road’s brewer Jesse Houck (who used to brew at Drake’s and 21st Amendment) can also seen briefly in a cameo. At the end, they give a shout out to other area codes, which at first sound made up, but they do mention my 707, so maybe not. All in all, a pretty funny music video. 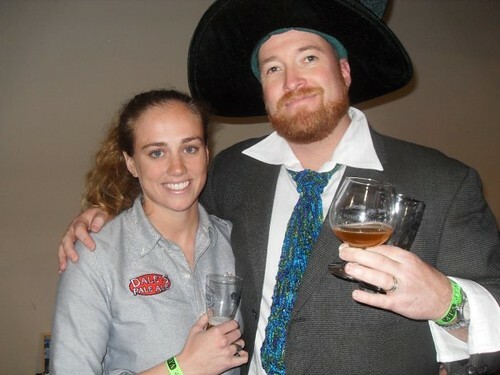 Houck and Golden Road President, Meg Gill, first met at 21st Amendment Brewery in 2008, where they bonded over their mutual love for canned beers and California IPAs. Adds Houck, “I am looking forward to sharing Meg and Tony’s vision of crafting quality beers for LA, and excited to be part of one of the fastest growing craft beer scenes on the West Coast.” A long time bay-area brewer, Houck brings a blend of chemistry and artistry to his brewing, having studied Chemical Engineering before becoming fascinated — and later obsessed — with home-brewing and beer. That’s awesome news for Jesse. 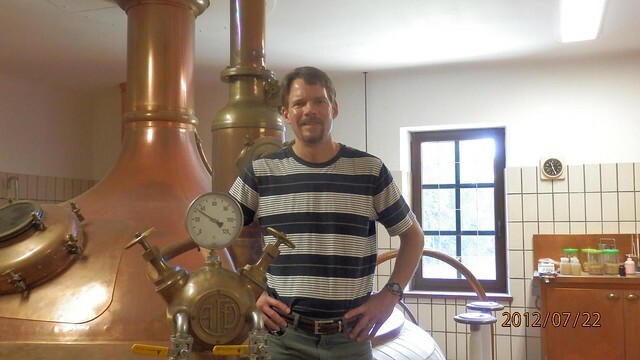 He’s a terrific brewer and should be a good fit at Golden Road. 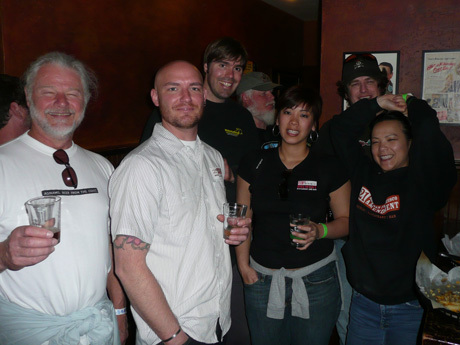 Jesse (2nd from the left) at the Triple Rock Firkin Fest in 2008. I know it’s a good thing when celebrities drink craft beer, because people tend to copy their behavior. So the more celeb’s drinking good beer, the more some people might pick it up, too. But I can’t help but find it a little sad, too. I just don’t find all the minutiae about famous people very interesting. It’s just not my thing, though I have friends and loved ones who feel otherwise, so I do tend to find out about these gossipy items anyway, sometimes whether I want to or not. Case in point, I just learned that actress Charlize Theron served Dogfish Head’s 60 Minute IPA at her house in Los Angeles during the Super Bowl. And that’s great, don’t get me wrong. Charlize Theron was, at one time, on my list of five (married men will know what I’m talking about here) so I’m certainly glad to know she has good taste in beer. The whole thing was captured in nauseating detail in the U.S. Showbiz section of the UK’s Daily Mail in an article titled — believe it or not — We’re in for a Super night: Charlize Theron hardly breaks a sweat as she carries a case of beer to a Super Bowl party. They have five, count ’em five, photos of Theron carrying the beer from her car to the house. The running commentary is hilariously absurd, though I couldn’t help but hear it in my head as if being read by Robin Leach from Lifestyles of the Rich & Famous. To be fair, I’ve posted a photo of television celebrity Nathan Fillion drinking a Drake’s IPA through a curly straw, that my wife took during an L.A. Browncoats convention a few years ago, but somehow that seems different. Or maybe I’m just fooling myself. What I really wanted to know from the article is why she chose that beer, and how she and her guests enjoyed it. Now that I’d find far more interesting than how she managed to carry it a few feet without breaking a sweat.